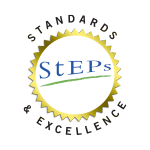 Exciting changes are happening at the 900 organizations taking part in the StEPs program (Standards and Excellence Program for History Organizations). Our “StEPs Spotlight” blog series highlights accomplishments by participating organizations. Below is another example of how StEPs is helping organizations take a leap forward by improving policies and practices, opening lines of communication, and setting goals for a bright future. In 1955, the town of Essex, Connecticut was about to announce its intention, according to news reports from the time, to sell Hills Academy. 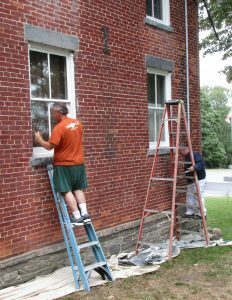 The 1832 historic school building was no longer useful for classroom space and had been rented to various tenants for many years. A concerned group of citizens sprang into action and the newly formed Essex Historical Society purchased Hills Academy for one dollar. 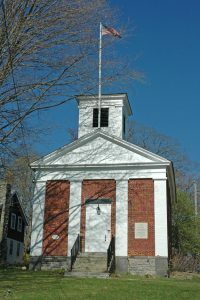 For the next thirty years, Hills Academy served as the society’s meeting house, home to its growing collection, and as exhibition space. Then in 1985, the Society for the Preservation of New England Antiquities (known now as Historic New England) deeded a historic house, the Pratt House, to EHS and the focus of activity shifted to the Pratt family narrative. Today, Pratt House continues to interpret 18th century farm life in Essex and the nine generations of Pratt smithies, many of whom lived in the house. The barn on the property houses changing exhibits including an early loom that is worked on by an award winning group of weavers. The beautiful meadow to the rear of the property is the site of the Community Garden and often the scene of community events. Hills Academy now serves as EHS’s library, offices, and collections storage in addition to offering meeting space. 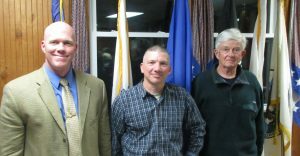 The Essex Historical Society serves the three villages of Essex: Centerbrook, Essex and Ivoryton. The organization has one part-time paid professional and approximately 60 hard-working volunteers. How did your organization become involved with the StEPs program? In 2015, EHS was one of twenty-three organizations accepted into the StEPs-CT program. StEPs-CT is a two-year program created by Connecticut Humanities with the Connecticut League of History Organizations, in partnership with the Connecticut Historical Society. 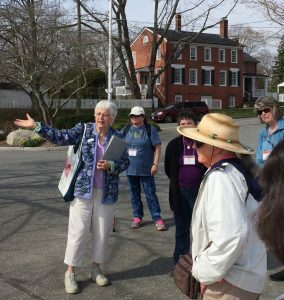 Using AASLH’s nationwide StEPs program as the foundation, the three Connecticut-based organizations guide local historical societies, historic houses and sites―and even a local library― towards excellence. To the StEPs program they have added a series of hands-on workshops, expert mentors who are on call to help with the rough spots, and a competitive granting fund. The StEPs-CT program is the first in the nation to implement the StEPs curriculum on a statewide level. What would you say is the most significant change or improvement within the Essex Historical Society as a result of taking part in StEPs? We have a much better understanding of the structure and procedures necessary to run a historical society in today’s world and we have, or know where to find, the tools to achieve that success. Our careful rewriting of our mission and vision statements created a significant change in how we do things on a daily and weekly basis. We use them as our measuring stick. Our mission statement has become almost a mantra. We also used the StEPs process as an organic strategic-plan-in-progress. The StEPs goals helped put all of those niggling to-do objectives into perspective. Earning StEPs certificates was one accomplishment, but it was much more satisfying to see thorny issues dealt with (deferred maintenance, bylaws revision, land-use policy, etc.) in a structured, systematic way. One could parallel the StEPs workbook and our StEPs-CT mentor as being the de-facto facilitators that would keep us on track. Tell us about some other examples of other positive changes within your organization as a result of StEPs? We created a governance structure that provides a backbone for how we run our organization in the best way to accomplish our mission and vision statements. In addition, we have totally rewritten our bylaws so they are now guidelines for how we operate. We have also written a strategic plan—something EHS had never done previously—and are beginning to measure board decisions based on what it says. Again, addressing the usage of our historic structures has been paramount. 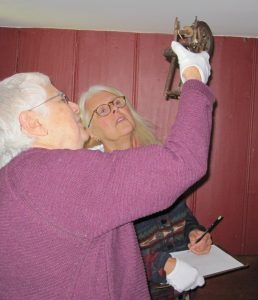 Guided by its new collections policy, the EHS collections team carefully inventoried Pratt House’s upper floor and made difficult decisions about the possible deaccession of some items. For example, we had an empty first floor and another unused area but we’re renting offsite storage (?!). At each Board meeting, we would look around the table and stare at one another about how to address these problematic (and labor-intensive) issues. Thanks to the in-depth and sometimes awkward discussions we had in our StEPs meetings, we are steadily developing plans to deaccesson some items and move others from offsite storage into the unused sections of our historic house which has better climate control and security. We are moving our library and offices from the second floor to the first floor at Hills Academy to improve visitor and volunteer access. These topics, let alone actions, would have been UNHEARD of before StEPs. Tell us how your organization is making its way through the program. As a member of the StEPs-CT group, we addressed the workbook sections one at a time, taking part in the group activities. A very important aspect of our plan was that we purposely involved different people from EHS for each section’s activities but always kept our same primary representative. 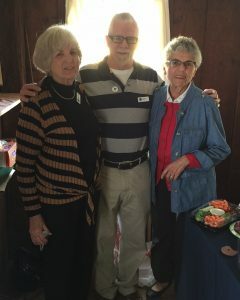 As a result, we had many board members and other volunteers participating directly in the program. This developed into broad board buy-in and created a deep bench of people who were knowledgeable about the process, often saving valuable time at meetings when we could get to work right away instead of spending time reviewing and explaining the project to those not familiar with StEPs. Moreover, every monthly board meeting included an agenda item of “StEPs next steps” so we could keep the entire board informed about what had and would happen. After a bit of trial and error, we figured out that our best interaction with our StEPs-CT mentor occurred by holding a workshop for each section. Our director and every EHS volunteer who had attended a StEPs-CT group session was included, so the number of participants grew each time, and so did the ideas and discussion. The workshops became dynamic, synergistic, and exciting for everyone—far beyond what any of us alone would have thought. Above all, the two years spent as part of the StEPs-CT program became cumulative; we could see solutions arising in 2017 from problems that seemed insurmountable in 2015. Has your organization been able to use StEPs as leverage in fundraising or in other ways? We have used StEPs as a springboard to explore how we use our two historic structures. We now see that our Pratt House is stagnant and our archives building is underutilized. StEPs has encouraged us to examine both situations and make changes, beginning with things that can be undone if they don’t work. The Pratt House has undergone a new treatment of deconstruction of several rooms for the purpose of displaying them in a “bare bones” way. This was a direct result of realizing that our exhibits had been in place for years. Making the structure itself the focus of the exhibit has been educational for us and a new and fun way to interpret history to our visitors. We still have many ideas for the future! Although this isn’t fundraising, it is interest-raising. The underuse of the historic structures has been a thorn in our side for years. StEPs gave our organization the opportunity to think creatively and permission to experiment. We’ve been using the phrase “the politics of care” to address buy-in from our members and the community. This past spring we were wildly successful with our new StEPs-inspired docent recruitment program. We increased our volunteer base by 50 percent! This will help transition our guide teams and invite a whole new group of people to become excited about the Pratt House. What advice do you have for organizations just starting in StEPs? Persevere through the Mission, Vision and Governance (MVG) and Management sections. They’re really hard, but they give you a base for everything else. If you are fortunate enough to take part in a StEPs group, realize the wonderful benefits of working closely with other organizations. The same goes for if you are fortunate to have someone who serves as your mentor like we had in the StEPs-CT group. These relationships are supportive across the board and helpful in many ways. Adjust the ways you try to work with your mentor until you find a way that works for both the organization and the mentor. Look at StEPs as not another “layer of things to do,” but as a system to work through issues that are too easy to ignore. You will need to make challenging decisions about priorities, but tackling those thorny issues is incredibly satisfying and much healthier for your organization in the long run. Finally, which section of the workbook has been your favorite? I (Sherry Clark, Immediate Past President) should say MVG because of the results, but it was not during the time I was going through it. I loved the Stewardship of Historic Structures and Landscapes (HSL) section because it made me realize how important it is to celebrate the historic spaces entrusted to our care. We must treat them properly and carefully, but also be willing to look at them from a different angle so we can use and enjoy them rather than worship them. And I (Melissa Josefiak, EHS Director) would agree that HSL was a favorite as that is where everything came together― all of the units really came “home” to our historic structures and impacted our physical location―and it was where we saw how the other units’ work was integral in solving the HSL issues that we had long ignored. You may be able to tell that there were two voices in this survey. Both our then-president, Sherry Clark, and our current director, Melissa Josefiak, were involved throughout the two-year StEPs-CT program and worked closely together, often sharing (or over-sharing!) the dramas and accomplishments for two and a half years. So for this blog post we each answered the questions separately and then pasted the responses together. We believe working as a team with a number of people who sometimes had different, but complementary visions is truly a hallmark of our StEPs experience. 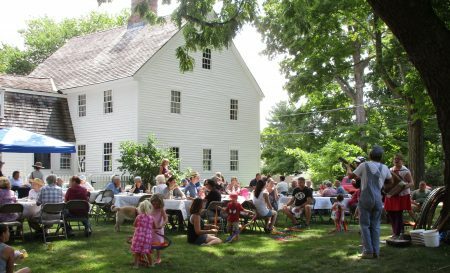 AASLH congratulates the Essex Historical Society on its accomplishments and thanks Melissa Josefiak, EHS Director, and Sherry Clark, Immediate Past President, for providing information for this blog post. 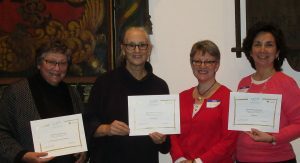 Since enrolling in StEPs in January 2015, the Essex Historical Society has earned six StEPs certificates.